They focus on revealing the future, and bending it to their whim. ^Due to the potential of such an effect to become very powerful, they generally have terrible offensive stats and Above Average Defense stats. A few can Special Summon themselves but even then, only 1 can be considered an Offensive option. Cannot be NormalSummoned or Set. Must first be Special Summoned by returning 1 Level 5 or higher "Visionary" monster you control and 2 "Mind"Spell Cards(except "Mind Control") in your graveyard to your deck. The Summon of this monster cannot be negated, nor can cards or effects be activated in response to the Summon of thismonster. At the startof your Battle Phase reveal the top 3 cards of both player's deck, each player can Special Summon 1 Level 5 or lower monster of those revealed cards in face-up Defense Position; If a monster(s) is revealed by this effect, inflict 400 Damage to your opponent for eachmonster revealed in this way and return the remaining cards to the deck. If a card(s) you control would be removed from the field, you can Banish thismonster instead. You can Special Summon this monster from your hand by destroying 1 face-up Trap Card on the field, and by tributing 1 "Visionary" monster you control. While this monster is face-up on the field, the effects of your "Visionary" monsters cannot be negated. 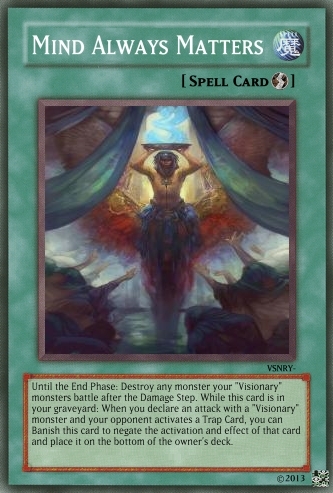 Your other "Visionary" monsters cannot be destroyed by card effects. Once per turn, when a monster(s) is revealed from the top of your opponent's deck: you can place 1 of the revealed monster(s) on top of their deck and inflict damage to your opponent equal to that monster's Level x200. When you NormalSummon this monsteryou can reveal the top 3 cards of a player's deck; place them atop their deck in any order. When this monster is Special Summoned, reveal the top card of your opponent's deck; place it on the top or bottom of their deck. If a face-up "Visionary"monster(except "Visionary Brothers") you control is targeted(by an attack or card effect), you can reveal this card in your hand to returnthat monster to your hand; Special Summon this monster, Battle cannot be conducted this turn. If thismonster is Special Summoned: look at the top card of your opponent's deck; place it on the top or bottom of their deck. 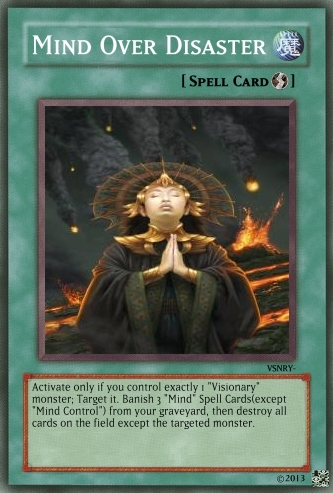 During your Main Phase 1, if you control a Level 4 or lower "Visionary"monster, you can Special Summon thismonster from your hand, only 1 "Hraktos, the Visionary" can be Summoned in this way per turn. When a card(s) is revealed from the deck except by theeffect of a Level 5 or higher "Visionary"monster: that player reveals 1 additional card. Once per turn, if a monster(s) is revealed from a Players deck, inflict 800 Damage to your opponent, neither cards or effects can beactivated in response to this effect. When you NormalSummon this monsteryou can add 1 Level 3 or lower "Visionary"monster from your graveyard to your hand then change thismonster to Defense Position. At the start of your opponent's Battle Phase reveal the top 2 cards of your opponent's deck, if aTrap Card is revealed by this effect, end the Battle Phase; place those cards atop the deck in any order. If this monster is revealed from your deck: Special Summon this monsterimmediately. You can Special Summon thismonster from your hand by returning 1 Level 4 or lower "Visionary"monster you control to your hand(only 1 "Visionary" monster can be Summoned in this way per turn, and only once that turn). When you Summon thismonster: reveal the top 2 cards of your opponent's deck; place them atop the deck in any order. When amonster is revealed from your opponent's deck, you can discard 1 card from your hand to destroy 1 monster on the field. If this card is revealed from the deck: Special Summon this monster, cards and effectscannot be activated in response to the Summon of thismonster. When thismonster is NormalSummoned: Draw 1 card. When thismonster is Special Summoned: reveal the top 5 cards of your deck, you can add 1 "Visionary" monster or "Mind" SpellCard(except "Mind Control") of those revealed cards to your hand(place those cards on the bottom of your deck). 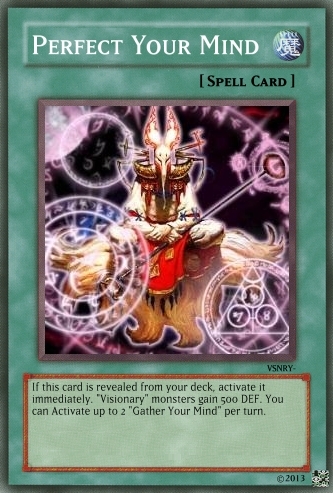 If you Tribute Summon this monster by tributing a "Visionary" monster, place that monster on top of your deck. 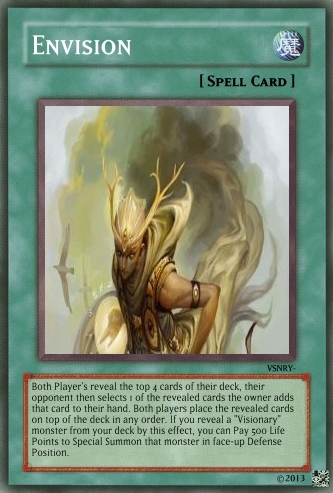 Once per turn: When a card(s) is revealed from the deck by a Level 4 or lower monster: that player reveals 1 additional card. 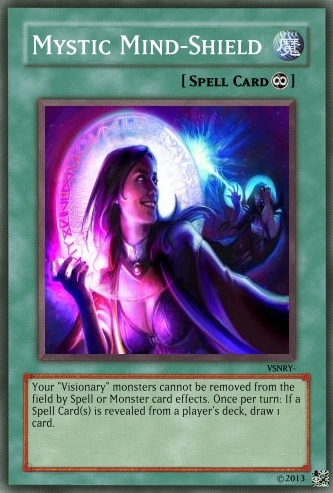 If you only control "Visionary" monsters, and you do not have any non-"Visionary" monsters in your graveyard: when a Spell Card is revealed from the top of a player's deck, you can return 1 card on the field to the owner's hand. You can Special Summon this monsterby returning 2 "Visionary" monstersyou control, or 3 "Mind"Spell Cards of the same name(except "Mind Control") in your graveyard to your deck. When a card(s) is revealed from the deck except by the effect of a Level 5 or higher "Visionary" monster: that player reveals 1 additional card. If aSpell Card is revealed from the deck, inflict500 Damage to your opponent and draw 1 card; place that card on top of the owners deck. If this monster is revealed from your deck: Special Summon this monsterimmediately. You can Special Summon thismonster from your hand by returning 1 Level 4 or lower "Visionary"monster you control to your hand(only 1 "Visionary" monster can be Summoned in this way per turn, and only once that turn). 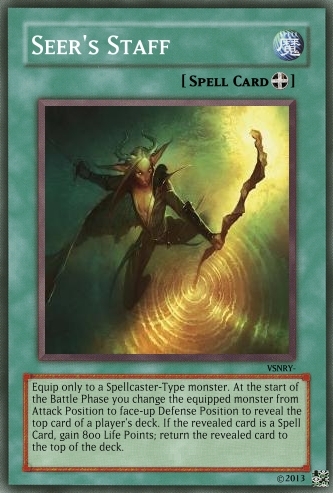 At thestart of your Battle Phase, you can change this Attack Positionmonster to face-up Defense Position to reveal 1 card from the top of your opponents deck, reveal 1 addtional card from the top of your opponents deck for each "Visionary"monster you control; if 4 or more cards are revealed by this effect, place 2 of the revealed cards on the bottom of your opponents deck. If you activate a "Mind"Spell Card, you can you can Special Summon this card(from your hand). At the start of your Battle Phase, you can target up to 3 "Mind" SpellCards(except "Mind Control") in your graveyard and place them on the bottom of your deck; This card gains 400 ATK for each card returned by thiseffect until the End Phase. 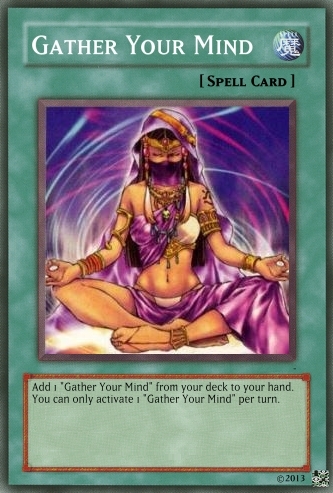 ^ Based on another Forum members card called: "Gather Your Other Mind", rather than searching for a "Gather Your Mind" and a "Gather Your Other Mind", it supports Visionary monsters and allows for a 2nd Gather Your Mind to be activated(like the original card). ^ allows for you to abuse your additional revelations, and recovers LP.